....it's really who you know. Below is a disgraceful example. Somewhere I read or heard from the MSM that some Wall Street firms had gotten allotments of the swine flu vaccine. Since there is a shortage of the vaccine, that "prioritization" did not sound fair or appropriate to me. Then I am talking to a friend who is a member of a construction workers union in the Philly area and he tells me he and his family got their flu shots at his union hall along with many other members [his local has at least 800-1,000 members or maybe even more than 1,000]. Again this "prioritization" does not sound right to me. Especially after I heard my niece took her baby [13 months old] for her shots and the pediatrician did not have any swine flu vaccine! Can anyone tell me WTF is going on in this country? .... more posts to go this year. My probation officer requires me to post 176 blog posts here every year and this is post #143 so I have to do 33 more! Piece of cake! My probation is over in 2019 I think. 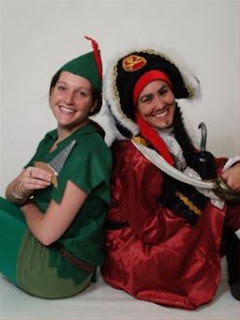 .......is how a niece of mine thought she looked in this website photo from her NYC charter school. She is a great kid and the school has to be thrilled to have teachers like her. Way to go Chrissy [she is the teacher on the right]! ....or what? Should I get bothered when so many people use email to communicate instead of just picking up the phone? Their emails, to me, seem to be an attempt to hide or they are scared to actually speak person to person. And yes, I know, I may be fast approaching fossildumb [sic] but wtf ! .............as revised yesterday by President Obama. WARNING - if you see any of these hardened criminals, be very careful, they may give you a piece of their mind! Insurance companies - are there any out there who don't need Nancy Pelosi to keep them honest? Seniors who express concern about Medicare cuts. All Energy companies unless they are GREEN ENERGY AND FINANCIALLY VIABLE ONLY BECAUSE THEY GET GINORMOUS GOVT SUBSIDIES. People who believe Obama was awake during Rev. Wright's sermons. ...........wreaked havoc, death and devastation on Mississippi and Lousiiana about 4 years and 3 months ago. So with billions and billions of dollars, the govt began re-building New Orleans and the surrounding area. Since it's been amost 1,600 days since Hurricane Katrina, I assume the rebuilding by the state and fed and local govts is 99% or 100% done. Am I right? I recommend the govt should now take its energy, tools, big ideas, grand plans and hard mofo govt employees and go to work to reform our health care system. Where could they go wrong? [Note to self : I must go and visit the "New" New Orleans and see how all that hard work and taxpayer money has made it the gem of the South!] It has, hasn't it?? "There's a good case that health-care reform will relieve corporate America of burdensome costs and boost job mobility, and that a new green economy is the wave of the future, but convincing people that these complex pieces of legislation are the most relevant way to address their problems is a tough sell, and Obama hasn't really tried, or at least it seems that way. What Democrats miss most is Obama's clarion call, the visionary rhetoric that cut through all the noise of the campaign and signaled a new day in American politics." Idiotor's comment: As if the cost of health care will just disappear and it won't be passed back to employers as a new, ginormous tax! .......as The Jolly Green Giant...heh heh....I guess, Stephanie, it's fairly common to be confused and uninformed when you spent four years in the Bronx and now you live in Queens and work in Brooklyn. It's like a triple NYC whammy. ...the Phils will win 12-5. I see Game Seven as Phils victory of 10-3. That will total 30 runs for the Fightin Phils in the last three games of the Series! [I do not make this stuff up- it will happen]. Furthermore, it may be decades before the Yankers win a World Series title in their new stadium. No one, not even Trooper York, will have a large enough reservoir of tears to shed during these long, dry years of Yanker failure. As a result, the Yanker fans will give up baseball and become Arena Football and Soccer fans. Heh. ....sweep for the non-Democrats in today's elections [but it is possible, the Dems will commit enough voter fraud to win the New Jersey election]. My prediction is based on one thing- people everywhere are pissed and anxious due to incompetent elected officials and growing govt control into our everyday's lives. Let's see how the elections turn out. ...I could place a bet on the Phils to win the World Series. Since they trail 3-2 and the last two games are at Yankee Stadium, I bet the odds for the Phils to win it all again are pretty long so I would make some money when they do win! And, as you can tell, I feel confident they will win - they just need to bring their hitting shoes! Go Phils! ....will break Reggie Jackson's record of five home runs in one World Series. As I type this, Utley has four dingers already. He will tie Jackson's record tonight before Game Five is over and Utley will break the record in Game Six or Seven. Here is a pic from last night's Game Four which I saw in person! Go Phils. 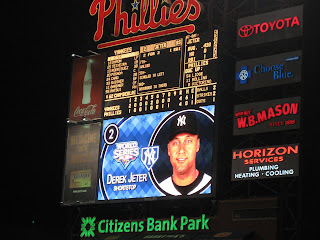 [FYI Derek Jeter must be dumb cause this pic has No.2 ? I thought the goal in sports was to be No. 1! Heh].